Did y’all know that Living Coral is Pantone’s 2019 color of the year? How fun is that?! It’s such a happy bright color and I have a special attachment to it. You can’t really paint aluminum windows. Well I’m sure you could, but these were in good shape and the factory finish would undoubtably hold up longer than anything else. I turned to Pinterest for inspiration and eventually settled on painting the house a coral color! After a good long painting process the house finally was painted and the transformation just made me ecstatic! The color is happy and the green windows look great! I absolutely love it. Honestly, now I don’t even think about it all that much. I come home and it makes me smile every time, but I don’t dwell on thinking about the color. Until recently, when I stumbled upon my old Pinterest board with tons and tons of inspiration pictures of coral colored houses! Are you ready to be inspired? I linked to as many of these as I could, but let me know if you know the source of any of these images and I’ll update the links properly. First up is this cutie with it’s adorable rounded roof line. If this was a dormer, it would be an eye brow dormer, since it’s the entire roof, I’m not sure what it’s called, but I am OBSESSED. 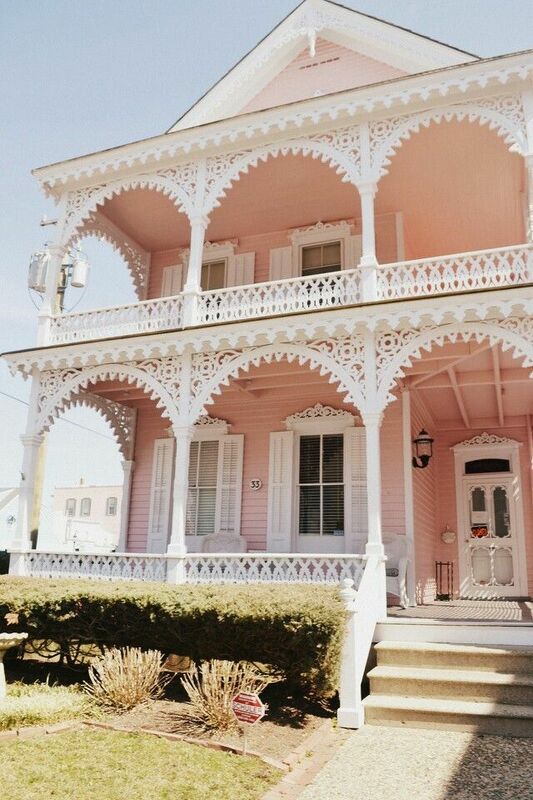 With that kind of charm, painting this house a corally pink with white trim is just a given. Then there’s this blushing beauty. This coal house is just a drop of coral in a pool of white and I am HERE FOR IT. Stunning. Lovely. Charming. Amazing. And is that a lilac bush next to it? I mean, this is good people! Not all coral houses are sided! Look at this lovely little stucco cottage. Tall and skinny, just like I like ’em! I adore those shaped topiaries and boxwoods out front too. Not sure if this is in Europe, but it’s definitely giving off some European vibes! This house looks very Southern to me and I just can’t get over the black trim details. Black and white and pink could go totally wrong, but not here. The person who chose these paint colors knew what they were doing! Plus is that an oval vent at the top of the house? Who knew a house vent could be so cute!! This next home has a special place in my heart for sure! I mean LOOK AT THAT TRIM WORK. THOSE DETAILS!! It’s like a lace veil over a blushing bride’s face. Was that the most overly cutesy metaphor ever? Possibly. But I’m okay with it; this house is 100% worth it. I just can’t get over all that trim. It’s a gingerbread house and someone actually lives here! And then there’s this guy. The world’s most cheery entry. It’s just… SO FREAKING CUTE. And calm. And reassuring. And happy. Are you smiling? I’m smiling! This place is adorable. More Southern charm here again. More black shutters. Who needs paint colors? Because this is it – just color match to this. I love that the color of the white trim is just ever so creamy and allows this to feel a tad less like your goth little sister. Plus, I am all about these rocking chairs. I want one. I want three actually. I adore rocking chairs so much! Another charmer from the late 1800s/early 1900s. Look at those arched windows. Clearly if you have arched windows, it’s time to paint your house a cirak color. The photo quality makes the trim on this little sweetie a bit yellow in tone but looking at the porch posts I think it’s actually a bit more white. My favorite part? A tie between the slightly darker coral painted stairs and those gorgeous stained wood double doors. Or maybe it’s the detailing on the porch railing balusters. I don’t know! It’s all too good! This one, this one. This one really has my heart. It looks like a house you find in the medieval neighborhoods of some of the oldest cities in Germany! 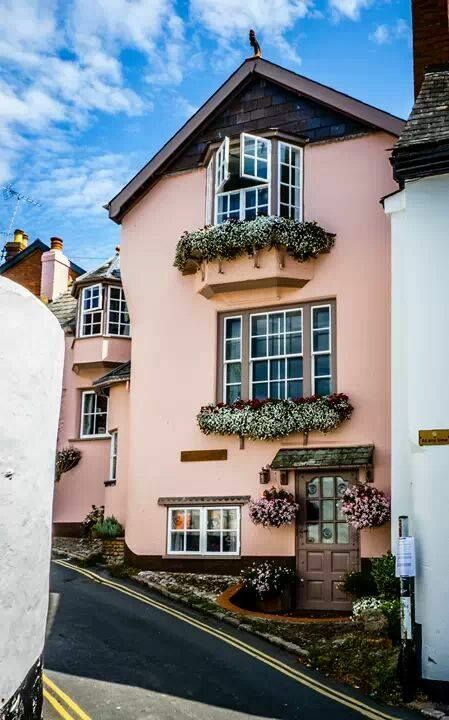 Those window boxes, those flowers. All of that is just amazing. Look how the house ties into the grade of the hill too. Those details are just so charming! And look how it wraps the street around the corner too! AND THAT TURRET DORMER!! I will quit my job and move into that dormer tomorrow. Pretty please?! Ivy covered coral houses? I bring you guys the good stuff. Do ivy covered houses remind anyone else of Madeline? This one has a lot going for it too. That arched window above the porch and entry doors. Those porch columns. That ivy again. I love it. And look at that little white bench nestled in the bushes out front. I want to sit there and read a book, not just any book: Madeline! This one reminds me a lot of Berrybrier because the details of the architecture are most similar. It’s a early 1900s folk house with simple details. And it’s freaking cute! This house makes me want to add little decorative moldings above the windows here at Berrybrier. It’s a small detail, but it just adds so much! Okay, are you out-pinked? I might be out-pinked. That was a lot of coral colored houses! Are you inspired to go bold and try something interesting? I have seen about twenty thousand million hundred beige and grey houses and I am ready to see some color out there. So hop to and make it happen! Go bold with coral or navy or teal or red or green or literally anything that’s not greige okay?! Okay, I love you, thank you bye! You may have heard that Rust-Oluem is donating $10 to Bright Pink for every project with the tag #paintitpink for Breast Cancer awareness this month! Bright Pink is an organization that aims to save women from Breast and Ovarian cancer. Breast Cancer is close to my heart since one of my namesakes has battled it in the recent past. Since I’m always up for a spray paint project I jumped on this challenge! Now, I wouldn’t say pink is one of my go-to colors. I wear it infrequently and don’t really want a lot of pink in my home. However, pink can be one of those awesome bright, happy colors that creates an awesome pop! when used well in a space. I decided I wanted just that kind of pop. During a recent IKEA trip I picked up some of their pots. (I seriously cannot leave IKEA without a few of these in one size or another, I have a problem! #addicted!) I wanted to put a few on top of my toilet to add some greenery to the bathroom and I wanted some for the kitchen windowsill above the sink for succulents. I love plants, they make me feel so happy an alive. 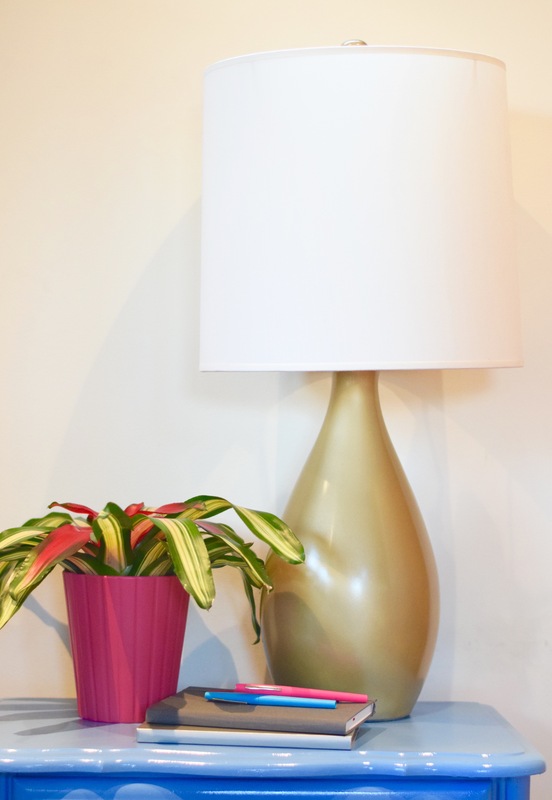 When you add them to a room, it really brings a space together! Plus, they take in CO2, put off oxygen, and promote better indoor air quality! I grabbed this planter pot for the Paint it Pink challenge while I was at IKEA, I figured it would look good as a color pop! on a shelf. 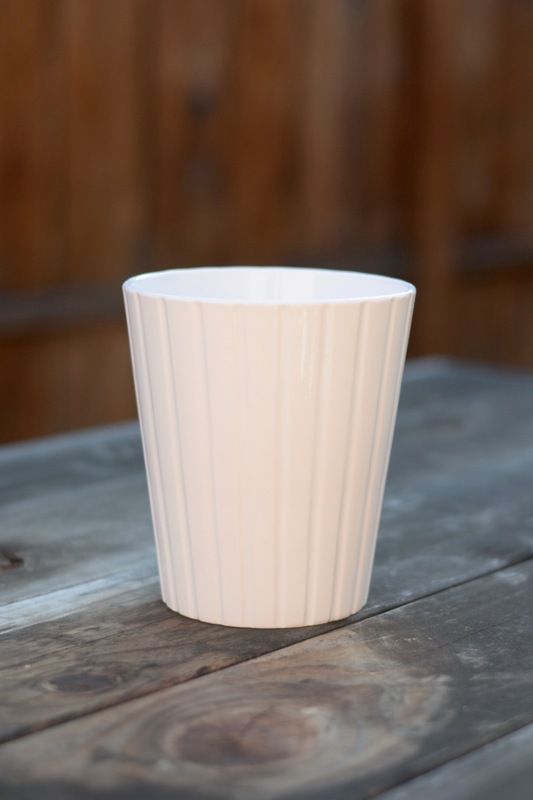 Because I am addicted though, I also bought eight of the smallest version of these pots too. For another project. That I decided to start simultaneously. Call me crazy and you’s be right! The next time I was at Home Depot (okay, okay, it was the same day, because I’m always there! 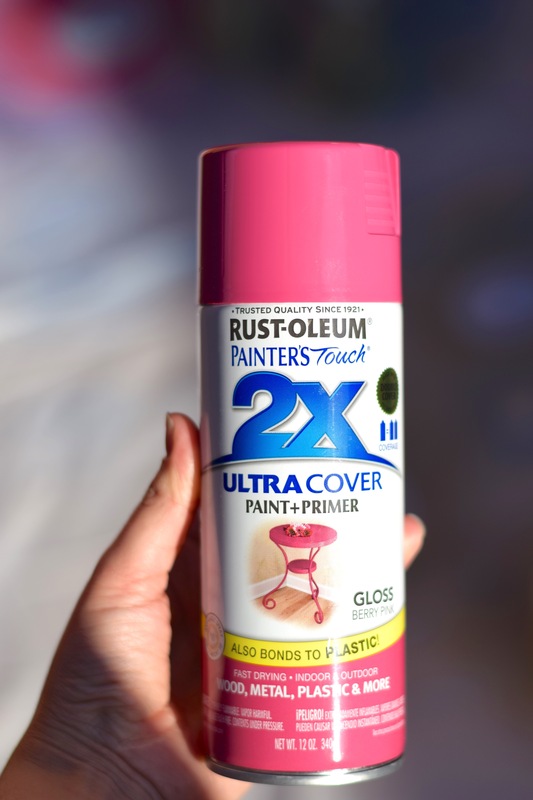 ), I picked up Rust-Oleum’s Berry Pink spray paint in Gloss. Then it was actually time to get painting!! 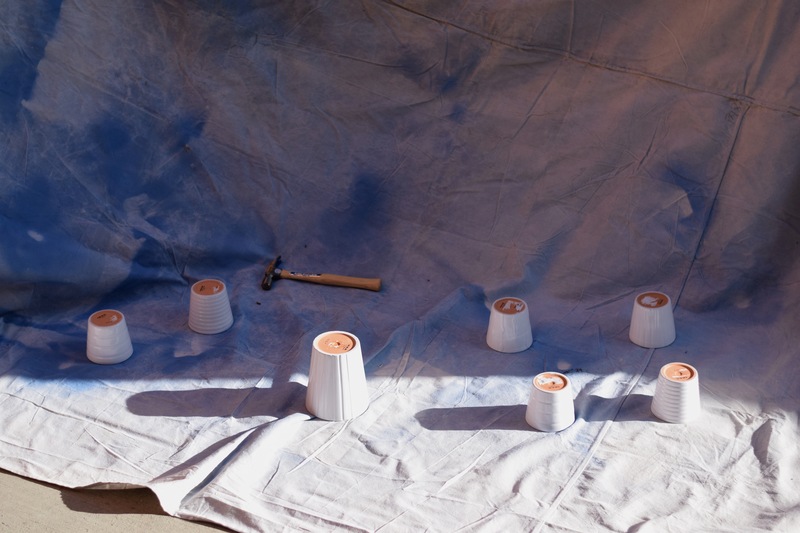 I set out all my pots on my canvas tarp, put on my elaborate painting mask, and got to work! Five minutes of work and two quick coats later and my pot was bright pink! Such a happy color! 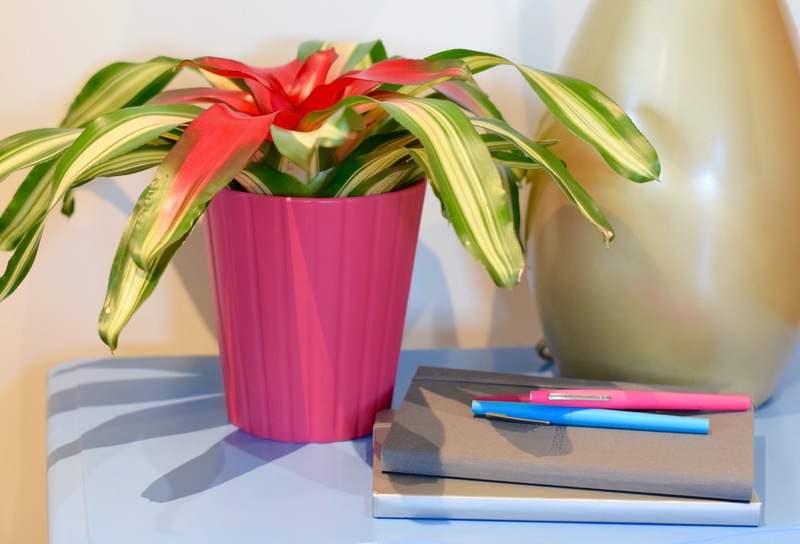 I popped in this bright pink plant, I thought the pink of the plant tied into the pink of the pot quite well! 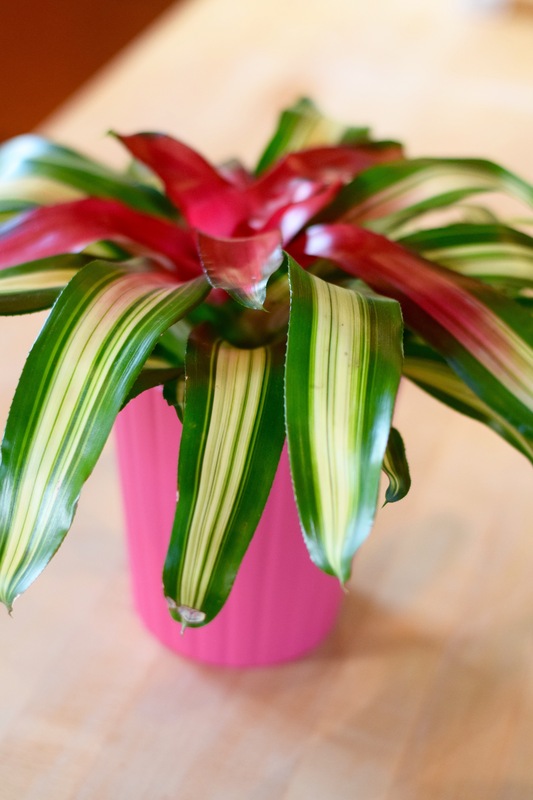 And look how the pinks brought out that awesome stripe-y green leaf! How amazing in nature? SO AMAZING! I love the way this looks! It is such a great pop! of color. It’s more than a pop! It’s like a straight POW! to the face! Did you participate in the Paint it Pink Challenge?? What was your project? I thought Katie Bower’s growth chart for her niece was just too cute! !